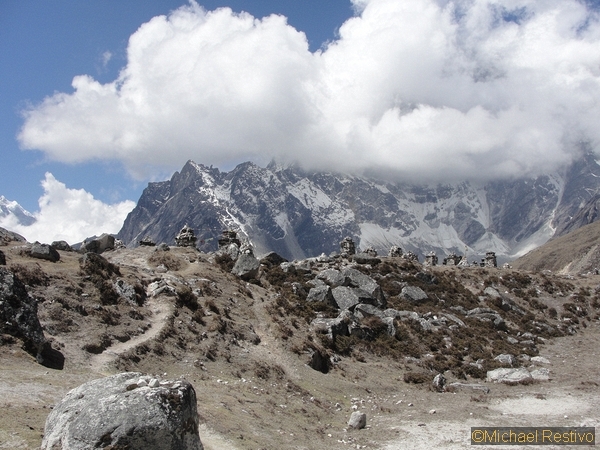 Everest Base Camp Trek Part 2: Namche Bazaar to Lobuche This is part 2 of a 3 part trek. 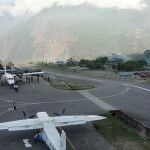 Part 1 is Lukla to Namche. The fog around Namche Bazaar had lifted and the skies were clear as we set off early on the morning of day four bound for the monastery of Tengboche. Climbing out of the town, we followed a ridge behind the city that led to a thin pathway on the hillside, dotted with Tibetan chortens, the traditional prayer towers adorned with the ubiquitous, colorful prayer flags. The trail wound around several rocky moraines and the morning was a pleasant break from the constant uphill of the last two days. Suddenly as we rounded a corner, the valley opened up and the magnificent Himalayan giants made themselves fully present for the first time. To the east in constant view was Ama Dablam, with her twin summits and hanging glacier. Just in front of us were the nearly identical peaks of Nuptse and Lhotse. Rising just behind Lhoste was a hulking mass of gray stone. 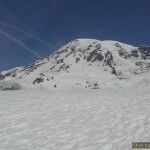 Snow led up its steep slopes and it was clear that a constant blizzard was blowing at the top. For the first time, I was looking at what I had come so far to see: Mt. Everest. My first impression of Everest was one of awe and intimidation. It’s not the most beautiful mountain of the group; however, its scale is undeniable. A climber once remarked that Everest is “the fat man in a room of beautiful ladies.” Nonetheless, the clear weather and the sight of our objective motivated and excited us. After lunch and tea in the shadow of Ama Dablam, we set off for the long forested hike to Tengboche. Two days before, we had to make an incredible and exhausting uphill hike to reach Namche. To reach the monastery, we’d have to test our strength once more, as we had to climb down to the lowest point next to the river and then re-climb nearly the entire height again to reach the town. With legs having barely recovered from the day before, my guide and I pushed through the long forested trail. Crossing several rickety wooden bridges over the raging rapids of the river, we had to compete for our spot on the trail with nearly endless yak trains. Late in the afternoon, my guide and I came out of the thick bush into a pastoral clearing. Passing under the entrance temple, we spun the prayer wheels for good luck before coming before the monumental monastery of Tengboche. The drone-like sounds of conch horns, traditionally a call to prayer, announced our arrival. 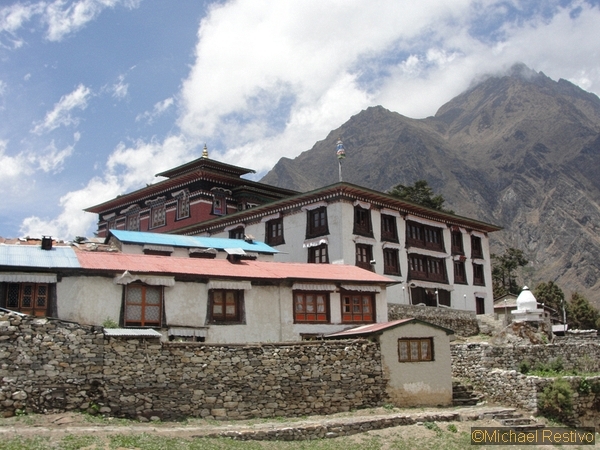 The monastery serves as the main teaching and learning center for all monks in the Khumbu. Built in 1923, it tragically burned down in an accidental fire in 1989 before being rebuilt in 1991 with the help of Edmund Hillary. 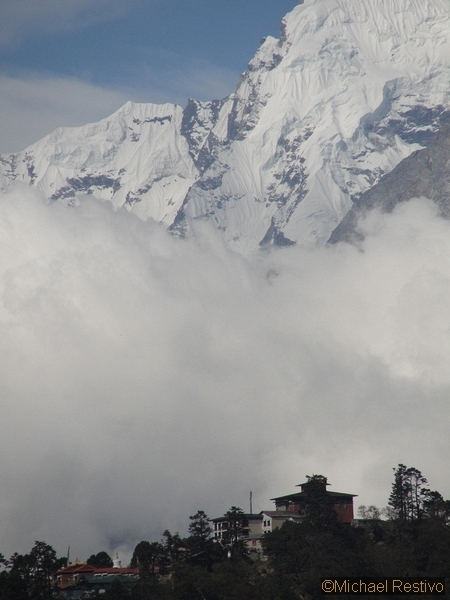 Tengboche is famous because every climber and trekker is blessed here for good fortune on their expeditions. One of the treats of Tengboche is its world-famous bakery. Being far away from Namche, the accommodations were much more spartan but there was a small baked goods shop in the far end. Shockingly, they even had a true cappuccino machine! My guide and I indulged in hot apple pies and decadent chocolate cakes. Not only a reminder of home but excellent energy food for the upcoming trek. As dusk fell, we were invited to sit in on a puja ceremony. A puja is a cleansing ceremony, meant to dispel all bad spirits and misfortune. Spirituality guides all live here, and every person no matter their faith or ethnicity is invited to join. Inside the main prayer all is a boisterous and party-like atmosphere. As the spicy smell of incense fills in clouds of smoke around the room, cymbals clash and drums pound loudly as the lama, or the head monk, makes offerings to the large, gilded statue of Buddha. 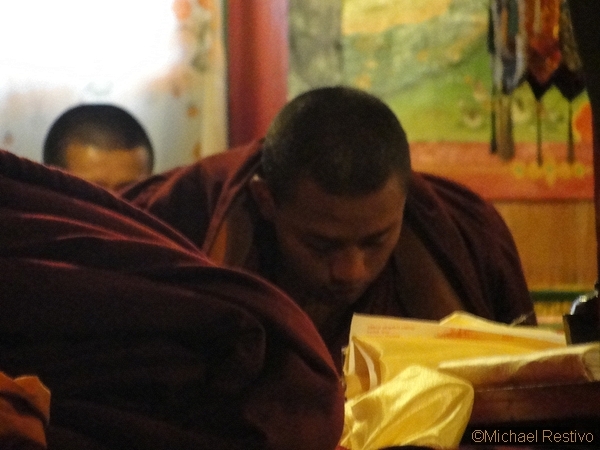 The invitees to the ceremony sit on the floor as the monks, dressed traditionally in their crimson and mustard colored robes chant and invoke good spirits and energy all around the room. 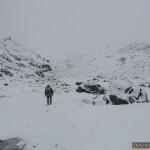 Our puja complete, we set off the following morning for the alpine desert and the hamlet town of Dingboche. Above the tree line, we set off through the Imja Khola pass. The green foothills were now replaced with dry branches and juniper shrubs as Pumori flanked us in the west while we made the final climb into Dingboche. 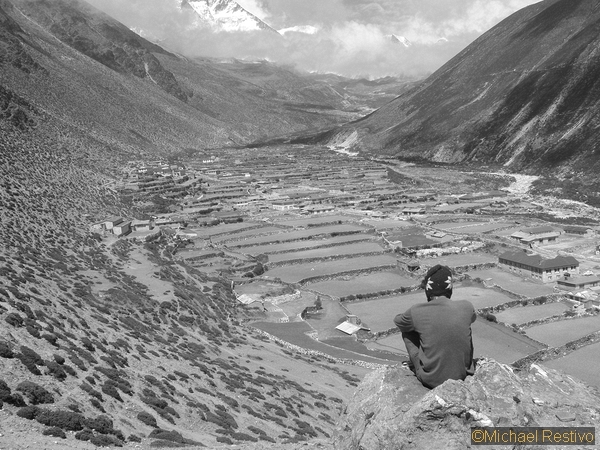 Dingboche is a series of small farms and lodges set in the valley just under the Khumbu glacier. We would be spending two days here to acclimatize. 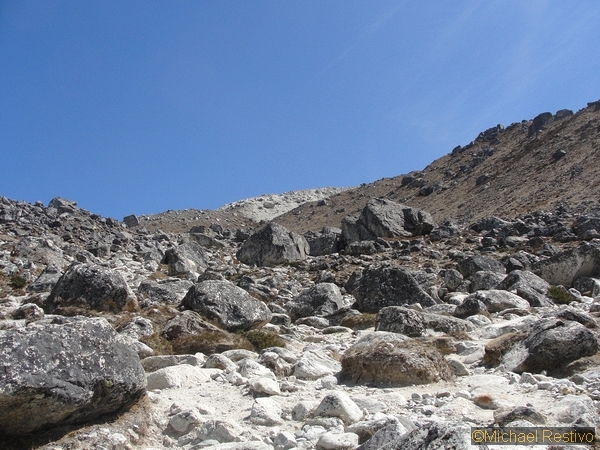 After a night of playing pool and cards with a host of other western trekkers, my guide and I awoke early the next morning to explore the valley and take an acclimatization climb up Chukking Ri, an 18,208-foot peak at the edge of the valley. The trail up the peak wasn’t strenuous, and as we got to the top, we were given a spectacular vista of Lhotse, Ama Dablam, and Island Peak. Breathlessly I took in the view, and then noticed that Chukking Ri was 2 miles west of us. In our excitement, we’d accidentally climbed the wrong mountain! From Dingboche we were to climb to Lobuche, a tiny, dusty, two building town. After crossing through another arid desert, we had to make our way up a sloping rise full of large boulders and uneven terrain. The exhaustion of climbing the last two days coupled with the altitude took its toll and it took my guide and I about two hours to make our way uphill. At the apex of the rise, we were now in the shadow of Ama Dablam, looming as big as ever. Constructed along the side of the ridge were several chortens of all sizes. In one of the most sobering moments of the trek, we were in a field of memorial stones and monuments to lost climbers and Sherpas. The largest chorten is dedicated to the American Scott Fischer, tragically lost in the infamous 1996 disaster. 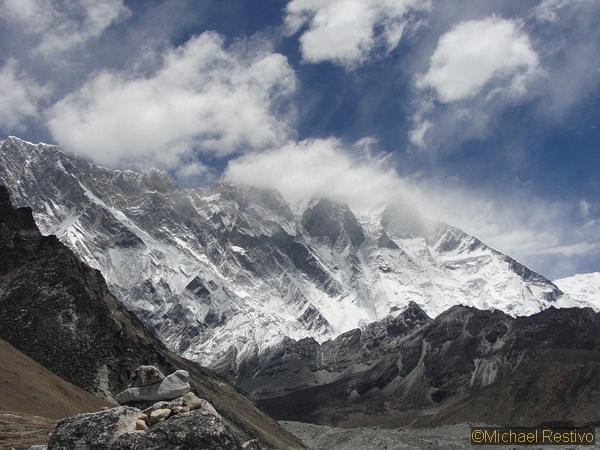 Others are reserved for climbers on Lobuche, Pumori, and Makalu. 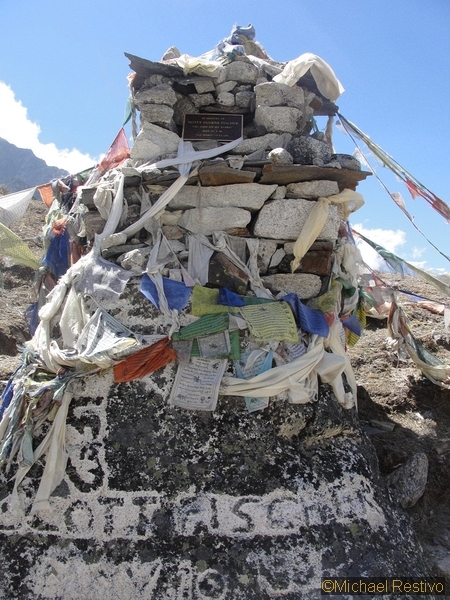 Two of the stones were dedicated not to climbers, but to trekkers, victims of altitude sickness. It was a reminder of the unforgiving wilderness we found ourselves in. After paying our reverence, we pressed on. Having not seen a single bush or tree for over two days, the terrain was sharp and unkempt with stones and hills. We pulled into Lobuche, a miserably small village at the edge of the glacial valley. I struggled to adjust and at this altitude I could feel my head pounding. We dined on noodles and fried rice to keep our carbs up and drank lemon tea to make up for the lack of moisture. The wind here was unforgiving and bitterly cold but we were only hours away from Base Camp. As I settled into my sleeping bag for the night, I gathered my strength for the day ahead. Tomorrow we would be making our way to Gorak Shep, and then from there, the final hike towards our objective. I am a writer, photographer, rock climber, traveler, and explorer. My travels have taken me throughout Europe, Japan, Nepal, and the Western United States. I enjoy climbing, trekking, camping, and whitewater rafting. I am an art and history buff and I feel just as comfortable in museums and historical sites as I do in the wilderness. 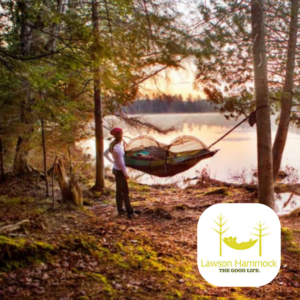 I aspire to inspire others of my age to travel more and embrace an outdoor lifestyle. When I’m not out in the wild I enjoy writing, reading, music, and an irrational fear of roller coasters.